Algiers (AFP) – France has called for a United Nations Security Council meeting over “humanitarian risks” as fighting escalates in Syria, its foreign minister said on Sunday in Algiers. “France is very preoccupied by the situation in Syria and by the brutal degradation of the situation,” Jean-Yves Le Drian said. “This is why we have called for a Security Council meeting to evaluate all the humanitarian risks, which are very serious,” he said on the sidelines of a meeting for western Mediterranean countries. His comments came after Turkish forces on Saturday launched an operation to oust Kurdish militia from the northern Syrian enclave of Afrin. Le Drian spoke to his Turkish counterpart in a telephone call on Sunday morning, his staff said. The French minister also mentioned tens of thousands of Syrians trapped in a besieged rebel stronghold outside Damascus, Eastern Ghouta, which has come under deadly regime bombardment this week. He spoke of tens of thousands more forced to flee fighting between Russia-backed regime forces and jihadists in the northwestern province of Idlib. Le Drian called for a halt to fighting and demanded access to humanitarian aid for all. Idlib and Eastern Ghouta were two of four “de-escalation zones” agreed last year by rebel backer Turkey and regime allies Iran and Russia. “It is important that everything be done for the ceasefires to be applied very soon and that a political solution finally be embarked upon,” he said. 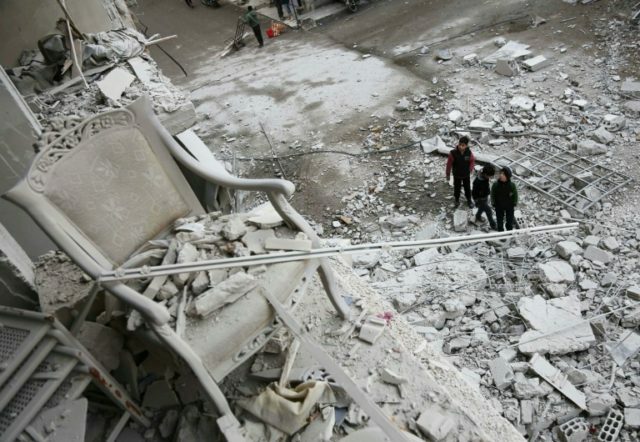 Since it erupted in 2011, Syria’s conflict has killed more than 340,000 people and displaced millions.